Are you drinking apple cider vinegar yet? I do and I LOVE the amazing health benefits. Apple cider vinegar can help with sinus infections, relieve allergy symptoms and even help with arthritis. How does it do all of these amazing things? Traditionally, vinegar is made through a long, slow fermentation process, leaving it rich in bioactive components like acetic acid, gallic acid, catechin, epicatechin, caffeic acid, and more, giving it potent antioxidant, antimicrobial, and many other beneficial properties. The “mother” of vinegar is a cobweb-like amino acid-based substance found in unprocessed, unfiltered vinegar. This is an excellent indicator that your vinegar is of the best quality. Most manufacturers pasteurize and filter their vinegar to prevent the mother from forming, but the “murky” kind is best, especially if you’re planning to consume it. 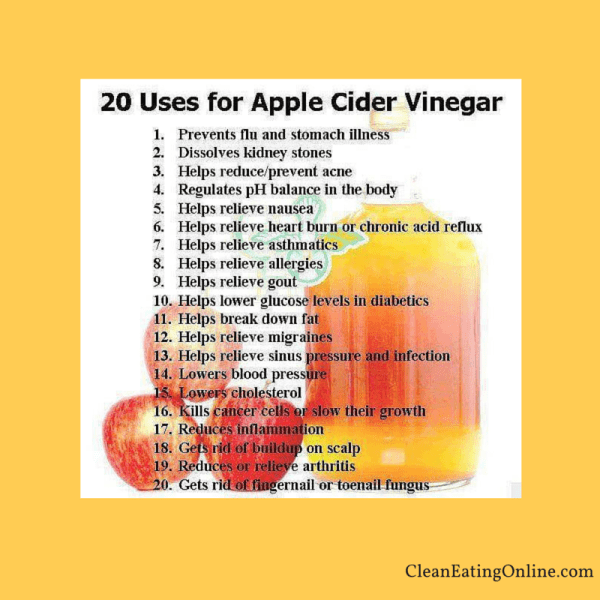 I’ve used Bragg’s apple cider vinegar for years. You can generally find it it most grocery stores or at your local health food store. How much should you consume? Personally, I drink 2 teaspoons of apple cider vinegar in 8 ounces of water daily. I admit I don’t love the taste but as long as I chug it down quickly and drink some plain water afterwards helps it to go down a bit easier.